InterFace Retail Investment & Finance is a national information and networking conference bringing together the leading buyers and sellers of retail real estate as well as the capital sources, lenders and intermediaries financing the transactions. 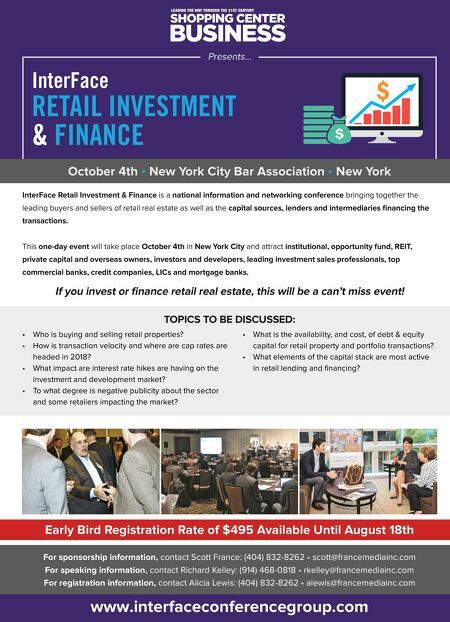 This one-day event will take place October 4th in New York City and attract institutional, opportunity fund, REIT, private capital and overseas owners, investors and developers, leading investment sales professionals, top commercial banks, credit companies, LICs and mortgage banks. 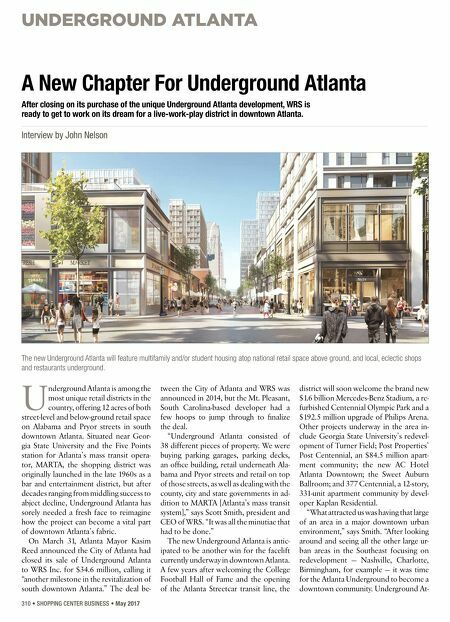 If you invest or finance retail real estate, this will be a can't miss event! TOPICS TO BE DISCUSSED: For sponsorship information, contact Scott France: (404) 832-8262 • scott@francemediainc.com For speaking information, contact Richard Kelley: (914) 468-0818 • rkelley@francemediainc.com For registration information, contact Alicia Lewis: (404) 832-8262 • alewis@francemediainc.com www.interfaceconferencegroup.com Presents... October 4th • New York City Bar Association • New York InterFace RETAIL INVESTMENT & FINANCE Early Bird Registration Rate of $495 Available Until August 18th • Who is buying and selling retail properties? • How is transaction velocity and where are cap rates are headed in 2018? • What impact are interest rate hikes are having on the investment and development market? • To what degree is negative publicity about the sector and some retailers impacting the market? • What is the availability, and cost, of debt & equity capital for retail property and portfolio transactions? • What elements of the capital stack are most active in retail lending and financing?